The next meeting of the Claverack Seniors will be held on March 8 at 1pm at the Reformed Dutch Church, Christian Education Building, on Route 9H in Claverack. The refreshment committee is Ellie Esselstyn, Alberta Cox and Betty Foss. Mary Jane Finkle will be Chairman of the 50/50 raffle. Judy Hartley will be treasurer for the Trip Committee. Ron Gabriele will present a program on History of Western Movies- the Silent Era. The History of Western Movies- The Sound Era will be presented the following month. Members are invited to come in their western attire. The following committee chairman have been appointed for the 2019 Year: Sunshine- Norma Barnard, Membership – Alberta Cox, Trips – Debbie Grau, Dark Horse – Pearl Mossman, Programs – Sylvia Schaummann with Ellie Esselstyn and Publicity – Joyce Pratt. April 17 – MGM Casino, Springfield, Mass., includes comps., sold-out. May 21 – Log Cabin, Holyoke, Mass., dinner and kings and Queens of Country Music Program, $55. June 12 – 9/11 Memorial and Museum, NYC, dinner on own at Horizon Diner, $45. July 16 – Whale Watch, Plymouth, Mass., meals on own, $30. October 9 – Delaware/Ulster Railroad luncheon train, $55. Non-members pay an additional $10 for trips. Pickups will be made at the former Town Highway Garage on Route 217 and at the AB Shaw Firehouse on Route 23. Payment is due a month before the trip date. For information or to sign up call Debbie Grau, Trip Director, at 518-610-1766. In inclement weather, meetings will be cancelled when Taconic Hills schools are cancelled, delayed or closed early. The meeting will be held on the next Friday. If cancelled again, the next meeting will be the regular meeting of the next month. Dues are payable in January. All residents of Claverack who are age 55 or above are welcome to join the seniors. New members are welcome. In order to join, a person must be 55 years or older and be a resident of Town of Claverack. Meetings are at the Reformed Dutch Church, Christian Education Building, on Route 9H, Claverack, on the second Friday of the month at 1 PM. Dues are payable in January. In inclement weather, meetings are canceled when Taconic Hills school is closed, delayed, or early dismissal. Should this occur the meeting will be held the following Friday. 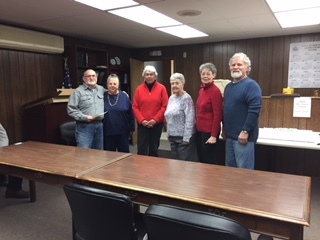 Dues for 2019 made payable to Town of Claverack Seniors are payable to Alberta Cox, membership chairman in the amount of $5.00 for the year. For additional transportation options, please view the Columbia County Healthcare Consortium’s website. The Office for the Aging serves as the focal point in Columbia County for matters related to aging. Through advocacy, services and planning and coordination, the Office for the Aging addresses the priority needs of older residents in Columbia County. The website below highlights services that encompass a range of community based and home care services. The website also includes links to a number of organizations and agencies that provide resources and services to seniors. 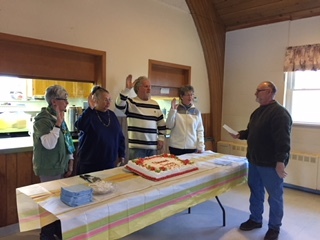 At the January meeting of the Claverack Seniors the above pictured officers (pictured left to right) were installed for the 2019 year by Deputy Supervisor Stephen Hook (far right): Ellie Esselstyn, Vice President; Marie D’Amico, Chaplain; Terry Guntert, President; and Linda Guntert, Secretary. Linda McNeill, Treasurer was absent.